AutoSock for Trucks are textile 'socks' which can be fitted in 2 minutes flat. 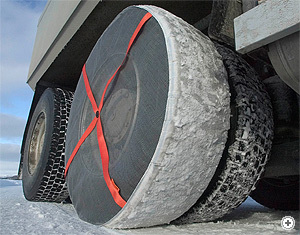 They use friction and high tech fibres to give truck tyres the grip they need to make progress on ice and snow. It's that simple, and at £125 or £145 RSP they're cheap when viewed in the context of the time, hassle and above all cost of having trucks stuck in snowy conditions - it's often the short distance between the depot and the main roads which is the biggest problem. AutoSock for Trucks are supplied in pairs, are reusable time and again and, being approximately the size of a folded shirt, are easy to store in the cab all year round for use when required. There's only one possible way to fit them, so no practice is needed. Fit them to the outer driving wheels - they'll self-centre on the tyres as you drive off. They were launched in 2006 after a long period of testing, evaluation and improvement; the car version has been available since 2002, with over 1 million pairs sold so far. 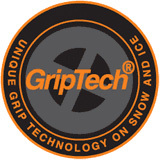 GripTech® describes the knowledge, embodied in AutoSock, about how to improve a tyre's grip on snow and ice. Achieving good friction in such a situation requires a solution to the problem of the slippery layer of water that's found between the tyre and the ground. GripTech® minimises the water film by 'wicking away' the surplus water - this in itself requires special fibres, but AutoSock also uses an optimum surface pattern to maximise the available friction. 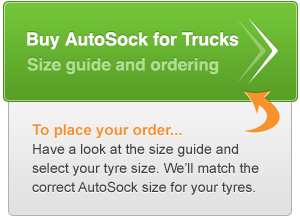 We also have AutoSock for most Light Commercial Vehicle tyre sizes - please check the standard AutoSock database. The car version has been selling since 2002, mostly on recommendation, and anyone who's had the opportunity to test them for real will immediately realise why. 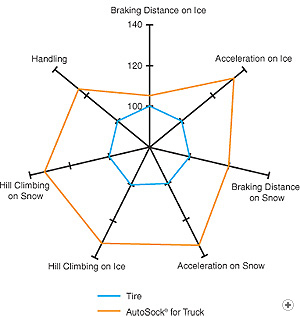 Most people are not only surprised but astonished at the difference they make to general traction, cornering and braking. AutoSock are approved by many car manufacturers, including Alfa Romeo, BMW, Fiat, Honda, Nissan, PSA Peugeot Citroën, Lexus, Mercedes-Benz, Mitsubishi, Toyota, and VW. Park the truck and put the brake on. For safety's sake the vehicle should not be on a slope during fitting, even though this was done during the testing phase. AutoSock for Trucks should be fitted to the outer driving wheels, starting at the top of the tyre and working downwards. Move the vehicle a couple of metres and then push the rest of the AutoSock into position. They'll self-centre on the tyres as you drive off. Do not turn off any electronic anti-skid programmes such as ETS, ASR, ESP, DSC. Drive with caution, avoiding wheelspin and hard braking and acceleration which will do the AutoSock no favours. You'll find that small holes are worn in the fabric if they're used on tarmac or heavily gritted roads, but the bands of Kevlar across the face of the socks should stop these from spreading. Use your commonsense to decide when they are finally worn out. Drag the AutoSock off the wheels using the orange bands, drive off them and pick them up. They can be washed out as required, but remember to pack them for the next time. AutoSock are only for use on ice and snow. Beware of people behind the vehicle who could be hurt by stones or lumps of ice being thrown backwards with great force. 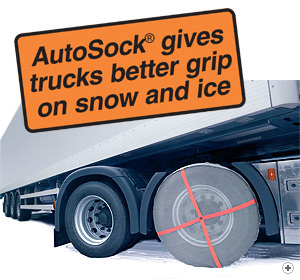 AutoSock are intended as a "get out of trouble" solution and are not a substitute for winter tyres! Drive with great caution when using AutoSock and be aware that wheels which are fitted with AutoSock will behave very differently to wheels without AutoSock.